BlackOut recently had the pleasure of working with pioneers in the field of kelp processing, Cambrian Biotechnologies. 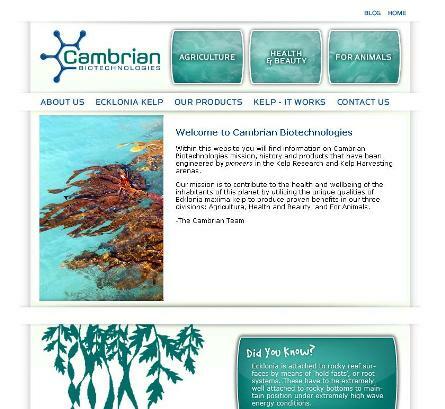 BlackOut provided web design and search marketing services for Cambrian, creating a site at www.cambrianproducts.com that demonstrates the uses and benefits of Cambrian’s Ecklonia maxima kelp-based products. We also developed the Cambrian blog that allows readers to keep up to date with the innovative work being done by Cambrian on a daily basis. Cambrian manufactures products in three divisions – Agriculture, Health and Beauty and Pet Products – utilizing a unique process that preserves the vitamin and mineral components of the kelp. The products are all natural and organic. See the results of BlackOut’s work at www.cambrianproducts.com.